This is The Boy, aka Felicity's beau. While she's gallivanting around sunny Palm Springs, she's asked me to give you all some useful content. And useful it shall be! By the way, for this and future posts, I'll be typing in this rather confident bold font. Felicity called me yesterday afternoon to tell me she was wearing flip flops by the pool, drinking a fruity drink, and generally not learning much from her conference. Meanwhile, I'm dodging raindrops and selling my plasma on a dreary, gray Saturday afternoon. But I'm not bitter. My parents visited last night and we took in a hilarious show from the Second City touring company. I surprised my Mother with the tickets for her birthday (ain't I a good son?). Before the show, we had dinner downtown at a not-frequently-visited restaurant, and their special was phenomenal. Guess what, dear reader, I'm going to share the recipe with YOU! I told you this post would be useful. 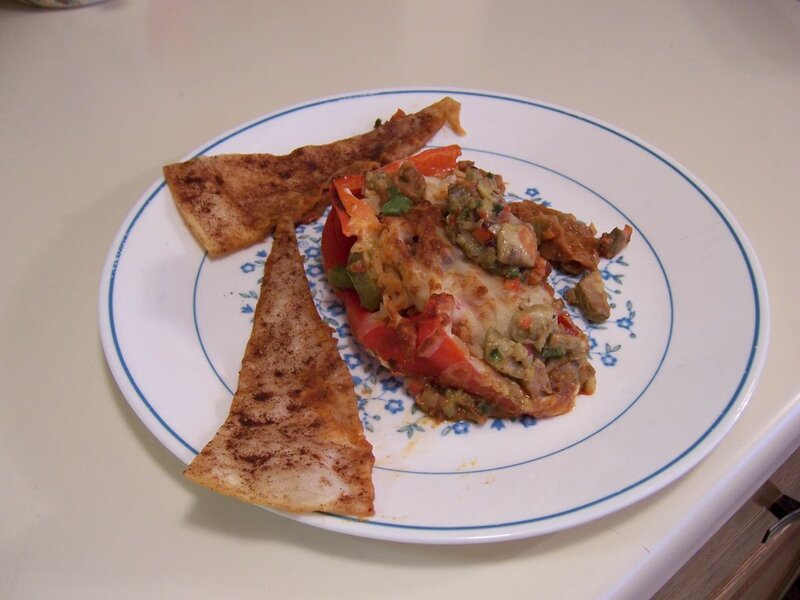 Get a large red bell pepper, cut it in half and dig out the white fleshy bits and seeds. Fill the pepper with cooked rice and chorizo chunks, onions, and fresh mozarella. Bake until the cheese is melted and the pepper walls go soft. Serve on a bed of soft refried beans, and sprinkle with fresh pico de gallo, cilantro, and ripe avocado chunks. For a garnish and/or dessert, lightly rub cooking oil on both sides of a tortilla, and sprinkle liberally with cinnamon and some sugar. Cut into slices pizza-style, and bake until crisp. Check out the pics of my leftovers, though there should be more refried beans under the pepper. Felicity shall return on Monday, upon which she should update you all on how much she missed me these last few days. And so, I sign off.